Is snoring causing you, or someone you love, to get less than a full night's rest? Are you or your partner having to resort to sleeping on the sofa just to get a good night's sleep away from the noise? If your rest is being disrupted by snoring, either your own or your partners, you should know that we have a solution for you. Sleep Apnea Sufferers - we are ready to help! 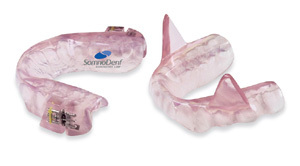 Dr. Randol uses a highly effective solution, the SomnoDent MAS, for the majority of patients suffering from Obstructive Sleep Apnea. Its exceptional levels of patient acceptance and compliance as well as treatment efficacy are backed by a large body of clinical research. Call our office to schedule your FREE Sleep Apnea Consultation. The SomnoDent MAS is only worn when you sleep. The SomnoDent MAS is very discrete, allowing you to close your lips so it is not obvious you are wearing it. You won't find a more comfortable MAS. Why? Because it is custom-made to fit your mouth and it does not impinge on your tongue. You can open and close your mouth normally as the SomnoDent MAS does not lock or fix your jaws together. Yes. The SomnoDent MAS offers a one year warranty against manufacturing defects, which means you can have full confidence in the product. The dentist will thoroughly examine your teeth and mouth and may use X-rays to confirm your oral health status, as well as ensuring that you are dentally appropriate for the splint. Dental impressions are required to fabricate a SomnoDent MAS. They are then sent to our laboratory where the appliance is made. Once custom made for you, the appliance will be fitted by Dr. Randol who will show you how to insert and remove it yourself, as well as how to clean and care for it.